At the House of Commons this evening the Culture Secretary Karen Bradley, producer Barbara Broccoli, BFI Chair Josh Berger and BFI CEO Amanda Nevill launched Future Film Skills - An Action Plan to some of the biggest names in film and education. The launch is a UK-wide call to the screen industries and education sector to support the new plan and for people with transferable skills and young people - especially those from under-represented groups, to join a booming industry, film, high-end TV, animation, VR and interactive media, that is recognised the world over for its highly skilled workforce and state of the art facilities. A new BFI commissioned report released tonight reveals that there are significant opportunities for the film workforce with an estimated 10,000 new entrants to the industry needed and 30,000 job opportunities over the next five years. Karen Bradley, Culture Secretary said: "The UK film industry is one of our biggest success stories and the films made here are loved by audiences around the world. For this to continue we need to nurture and foster the next generation of talent - both in front of, and behind the camera. The 10 point skills plan being launched today will be instrumental in helping to deliver this, as well as making sure that the films in the UK are truly representative of the UK's diverse society." "This initiative is meaningful for both Lucasfilm and the film industry at large," says Lucasfilm President Kathleen Kennedy "Diversity is just as important behind the scenes as it is on the screen. More points of view, more perspectives, and more voices will only make films better." This skills strategy is supported by Lucasfilm which haspioneered a pilot programme with the BFI placing 28 trainees - the majority of which are alumni of the BFI Film Academy, as paid trainees, working in various craft and technical roles acrossthe Untitled Han Solo Project, currently in production at Pinewood Studios. The Lucasfilm programme is an exemplar in industry-led youth training with a specific focus on inclusion and designed to provide opportunities to address under-representation in the workforce. On this programme 75% of the trainees are women, 45% come from BAME backgrounds, 68% were recruited outside Greater London, and 36% received free school meals. Some of the trainees spoke at the House of Commons event tonight (see Notes to Editors for quotes). UK film is worth £4.3 billion to the economy and is the UK’s fastest growing sector. The UK film sector currently employs 66,000 people, over 70% of whom are employed in film and video production. Some parts of the sector such as VFX and animation have seen a rapid growth in the workforce, as the UK has cemented its position as a global centre for specialist talent and capabilities. Based on these growth rates, Future Film Skills has identified multiple skills gaps across the sector - including key areas such as Production Department, Art Department, Construction, Electrical, Camera, Costume, Hair and Make-Up, Post-Production, and Visual Effects - and highlights the need for 10,000 new entrants to join the workforce in the next five years. The Future Film Skills 10 Point Action Plan draws upon the results of a review with practitioners across the industry from the Work Foundation that evidences the vital need to address the skills shortages and that tackling the lack of inclusion in the screen industries is the key to enabling future growth and competitiveness. The report shows that the film workforce comprises 12% from less advantaged socio-economic backgrounds, 5% with a disability and black, Asian and minority ethnic groups represent just 3% of the production and post-production workforce. Women make up 40% of the workforce and earn on average £3,000 less than male counterparts. The BFI’s five year plan BFI2022 sets out a goal that allp producers active in the UK are encouraged to voluntarily adopt the BFI Diversity Standards which focus on disability, gender, race, age and sexual orientation (as they pertain to the Equality Act 2010) and also seek to ensure that people from lower socio-economic groups are better represented. Demystify getting into the film industry for young people with easy to access career advice and guidance on the right courses. Provide bursaries and support services enabling people from all backgrounds to get into the film industry. Open doors for those with appropriate skills (from carpenters to digital creatives) to move into the film industry. Set up specific schemes to encourage industry practitioners to share their knowledge and expertise. Future Film Skills includes plans to provide equal opportunities for those from all backgrounds, irrespective of socio-economic background or geography, to have the skills they need to access jobs that will be created in the screen industries of the future. This will only be achieved by reaching out to the broadest pool of talent from across the UK, starting in schools through ‘Into Film’ (the BFI’s National Lottery-funded partner which delivers school film clubs and film education resources for teachers), and with support for the growth of craft and technical skills outside of London and the south-east. This commitment to the future, as set out in BFI2022, recognises the wealth of new opportunities as the industry continues to find fresh and innovative ways of storytelling through new digital technologies, fusing 21st century craft and digital expertise with traditional skills and crafts. By investing over £20 million of National Lottery funding from 2017-2022 into film skills, the BFI is kick-starting this new skills drive to encourage thousands to become a part of the success story that is UK film. It is anticipated this investment will leverage match funding from the industry’s own Skills Investment Fund and fund the backbone of the industry-owned and industry-led Future Film Skills 10 Point Action Plan. Future Film Skills has been developed as a result of a wide industry consultation led by the BFI with the Film Skills Industry Task Force, chaired by Barbara Broccoli and including BFI CEO Amanda Nevill, Creative Skillset CEO Seetha Kumar, Chair of the Film Skills Council Iain Smith, Double Negative MD Alex Hope, Ben Roberts, Director BFI Film Fund and producers Marc Samuelson, Fiona McGuire, Callum McDougall, Faiza Hosenie and Damian Jones. The Work Foundation was commissioned to look at the current and future needs of film in recognition of the potential and current economic growth of the film industry, whichcontinues to outperform other sectors considered to be booming, including construction, financial services, and information and communications. Future Film Skills provides a scale-able blueprint for the creative sector, with the UK creative industries currently accounting for 1 in 11 jobs, a rate that is rising faster than all other parts of the economy. A single, trusted online destination for anybody seeking information to start or progress a career in the industry. Offering links, networks and information for training and jobs in film throughout the UK, building on and linking to sites such as Into Film, HIIVE and BAFTA Guru. Developed by the industry for the industry, in partnership with higher education, to win the confidence of parents, learners and employers, this will build on the achievements of existing work and will involve industry and employers in setting up the scheme. We will complete and deliver a new Apprenticeship Standard which will be applied to courses for a range of job roles throughout the industry including production, distribution and exhibition. A responsive skills forecasting and planning service to respond to industry needs, and to ensure the regular supply of data across the sector on future skills opportunities. 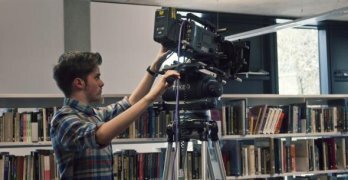 We will develop the success of the BFI Film Academy to work closely with industry, placing set-ready alumni as trainees on film productions across the UK. A new personal mentoring programme that offers bespoke support for individuals wanting to enter or progress in the film industry, and those returning after a career break. Including mentoring, pastoral care, coaching and opportunities to network, and awareness of specific job opportunities. Working with higher education and the new Institute of Technology we will partner to create a small number of world class Centres of Excellence for screen-related craft and technical skills. A new bursary programme designed to support individuals taking their first steps, and removing some of the practical obstacles to those currently under-represented in the industry. A new range of professional development courses, aligned with the latest technology and business skills will ensure our workforce maintains world-class skills. We will encourage the industry to support the future workforce through a number of schemes and campaigns including creating a database to match individuals with local needs, and which recognises enlightened employers who encourage skills transfer. Good to know about the strategy that will make people able to learn new filming skills to have best things in the way to make something awesome regarding the interest of public.